Sometimes I marinate for minutes (no, tens of minutes) on clever article titles, but today’s came naturally. After months of turning Eldrazi Temple sideways, I’ve returned to my beloved Temur Delver, and fetching out basic Island has never felt more right. I guess you don’t know how dirty some things are until you stop doing them. To me, Delver of Secrets epitomizes clean, honest Magic, sitting—or, hovering—firmly across from Eye of Ugin and Goryo’s Vengeance on Modern’s fairness spectrum. An audibled, awakening FNM with Monkey Grow inspired me to take the deck to SCG States. I was told the Montreal event marked Star City’s official foray into the snowy wilderness of Canadian magic, and in retrospect, I would have felt guilty playing anything but my longtime favorite deck at the inaugural tournament. Tarmogoyf and pals didn’t bring home a trophy, but I placed sixth and had a blast. Hopefully, this tournament inspires other dormant Delver lovers to join me in coming out of hibernation and playing Magic to its fullest. This build closely follows my (now only slightly outdated) guidelines for building Temur Delver in Modern. 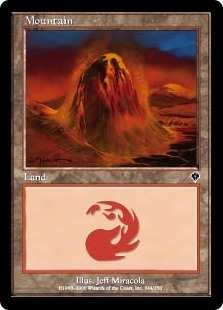 To keep things interesting, I also tried out some new tech, including the best card in Magic—basic Mountain! More Bolts: I expected heaps of Collected Company decks at this tournament, and maybe some Affinity. Zero players sleeved up the latter, stranding my Grudges in the sideboard, but I saw some Birds of Paradise. Modern seems to be getting increasingly friendly to dork-fueled fast-mana decks. Forked Bolt is an all-star in these matchups, and Tarfire’s Battlegrowth effect for Tarmogoyf makes it the favorite against linear combo or black delve strategies. 1. It butts heads with delve. Sometimes, we want to cast Mandrills before Traversing for another threat. Delve and delirium curdle so much that enacting that fantasy is almost never possible. Especially with a Blood Moon on board, we usually have to choose between casting Mandrills or casting Traverse in even moderately-paced games, meaning Traverse can only effectively come in for grindy matches. 2. It doesn’t get to Blood Moon fast enough. One of Traverse’s major upsides is its ability to find a Moon effect on command via Magus of the Moon. Unfortunately, paying four mana for Blood Moon really isn’t something Temur Delver can afford to do. Our other option is to Traverse for Magus now, and cast it next turn, but that alerts opponents to our game plan and gives them an opportunity to fetch a basic land. I found that in the matches we want Blood Moon for, we want to dig for it privately and play it on-curve. 3. We can’t make great use of a creature toolbox. The bullets I experimented with included Magus of the Moon, Izzet Staticaster, and Thrun, the Last Troll. Of the three, only Thrun panned out. Can you guess why? I only wanted him against grindy decks like UW Control. These matchups guarantee we’ll have delirium and delve food for Hooting Mandrills. But if we only bring Traverse in for attrition decks, why not simply run answers to attrition decks instead? By cutting the Traverses for hard copies of Thrun, for instance, we dodge disruption like Muddle the Mixture, Spellstutter Sprite, or Rest in Peace, all while paying one less mana to cast our creatures. In a deck that mostly exists because of the relevance of a one-mana Negate, Traverse’s single-mana tax hurts more than it would in a midrange shell like Temur Toolbox. Modified Revelry package: Before choosing flex spots, I recommend Monkey Grow newcomers stock their sideboard with a few tried-and-true packages. My three go-to’s include a Huntmaster package, running 3-4 copies of the Werewolf haymaker for aggro and midrange matchups alike; a Blood Moon package, playing no less than two of the powerful hoser; and a Revelry package, or a suite of versatile hate for Affinity. Only the Revelry package got a revisit this weekend. I’d settled on a 2/2 Destructive Revelry and Ancient Grudge split after GP Charlotte, but currently, I like running Natural State over the second Revelry. State gains us points against Affinity, but loses them versus random bombs like Worship or Form of the Dragon. Since Modern is so fast, and Temur Delver often forces opponents to play quickly, I think Natural State fits into the package well. Mountain: I had fun showing this card to opponents after matches and watching their faces contort in bewilderment. Some friends who’ve tried the deck have told me they sometimes experience difficulty casting Huntmaster of the Fells on time against aggressive decks. This issue definitely comes up sometimes, and that’s what the Mountain is for. Against hyper-aggressive strategies, we don’t necessarily have the time or the disruption to sit around and wait for land drops to magically appear off the top of our library. Nothing’s more embarrassing than eating hits from Master of Etherium and a Plating-equipped Vault Skirge with a pair of clunky Ancient Grudges in hand. Mountain comes in for Burn, Infect, Affinity, Tron, Grishoalbrand, and other decks that punish us for missing land drops. Against the decks we want Moon for, it can also replace Breeding Pool, which threatens to delay Moon’s resolution a turn if drawn. Of Modern’s many Zoo decks, Gruul is the easiest to beat. In other variants, Knight of the Reliquary and Scavenging Ooze can give us a hard time, but Gruul Zoo runs neither of these cards. We can usually force bad trades with our green creatures, and blow out Ghor-Clan Rampager tricks with Simic Charm. I lead with a Scalding Tarn, which I crack for Steam Vents to Bolt a Goblin Guide. 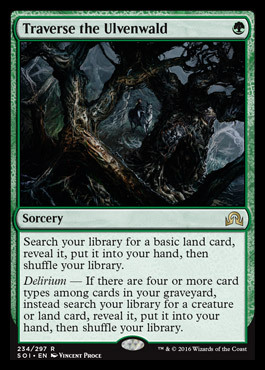 I follow up by fetching a Forest and resolving Tarmogoyf. My opponent responds with Kird Ape. I start swinging, Denying a Rancor and then Forked Bolting a Goblin Guide as my opponent fails to ever make a land drop beyond his first Stomping Ground. He concedes to a Hooting Mandrills. We both mulligan, and I keep a one-lander with two Serum Visions, Bolt, Tarfire, and Mandrills. My opponent starts things off with a turn one Vexing Devil. I pay four life to kill it, and draw a second Steam Vents for turn. I shock myself and play the first one to Serum into a green source, drawing Island and seeing Scalding Tarn, Huntmaster. I scry both to the top, with Tarn first in case my opponent plays Goblin Guide. He doesn’t, instead opting for Burning-Tree Emissary and a Rancor. I play my Island, cast the second Visions, and Tarfire the emissary. My opponent plays Wild Nacatl, and I fetch-shock-Bolt it on my turn and cast Hooting Mandrills. He plays Experiment One and passes, leaving mana up to Bolt Huntmaster on my end step. I draw another one, though, and beat my opponent with Shoal in hand. Even though it doesn’t touch Ape and Nacatl, I like Pyroclasm in this matchup, since it answers boards full of Burning-Tree Emissary, Goblin Guide, and Experiment One. Blood Moon can occasionally screw Gruul Zoo, but I think it’s a trap to bring it in against land-light decks that can easily fetch basics if they want to. Jund is one of the decks I was hoping to dodge today, the others being Eldrazi Tron and UW Control. The deck asks us to have all the right answers at all the right times and is historically one of Temur Delver’s worst matchups. My opponent remembers me from the Super Series and correctly puts me on Temur Delver. He also keeps a magnificent hand, dismantling my own handsome seven effortlessly. He Bolts my Delver, Decays my Goyf, Terminates my Mandrills, and makes me sacrifice my second Tarmogoyf with Liliana of the Veil. I Bolt his Confidant, but a Scavenging Ooze takes the game away. I mulligan into a slow hand with Disrupting Shoal, Curiosity, Blood Moon, and three lands. I play a land and pass, and my opponent tries Blackcleave Cliffs into Inquisition of Kozilek. I pitch Curiosity to Shoal so he doesn’t find out about the Moon, which I’m counting on to win me this game. I play another land and pass, and my opponent plays a second Cliffs and Dark Confidant. Moon comes down and locks him out of the game, and we laugh as he flips Kolaghan’s Command and then Kalitas, Traitor of Ghet to the awkward 2/1. My eventual Huntmaster eats Lightning Bolt, but his Wolf pal and a Hooting Mandrills secure the win. I keep a one-lander with two Visions, a Goyf, Blood Moon, Mandrills, and Mana Leak. The first Visions doesn’t find me any lands, and the second gets Inquisitioned away. My opponent casts Liliana of the Veil and a Huntmaster while I take a shame bath in a lone Breeding Pool. I learned at Charlotte to keep some number of Disrupting Shoal against Jund, since their removal spells and two-drop threats will outpace us if they can get the upper hand. Scour comes out here since they fill the graveyard for us, and Probe gets the axe since Jund frequently operates hellbent and I’d rather have a higher threat density than more air. The costs of these cantrips becomes troublesome with a Moon on the table, too, since I often only have one blue source in play. Three Moons might seem like a lot, but Jund likes to Inquisition or Thoughtseize them away when they get the chance, making Moon sometimes function like an “extra threat”—that’s one less creature they’re stripping from our hand. They also Decay the Moon when they have shocks up to pay for the removal spell after the enchantment resolves, so I like boarding in the full three copies. I play against this person almost every time I go to Face to Face, which admittedly isn’t that often anymore. The last time we dueled, she narrowly beat my Delvers in the finals of a monthly Modern tournament with UR Twin. I assumed she’d be on some sort of Snap-Bolt deck, and her turn one Scalding Tarn confirmed my suspicion. Delver blind-flips off a Lightning Bolt and lives, but my Tarmogoyf eats a Mana Leak. Probe shows me Keranos, Snapcaster Mage, Remand, and Steam Vents, and soon my opponent starts chaining four-drops. Jace, Architect of Thought and Cryptic Command both get Leaked, and two Bolts to the head finish what the Aberration started. This game doesn’t prove more fruitful for Modern’s castrated UR boogeyman. Delver gets Bolted this time after failing to flip, but my Probe shows no answer for this Tarmogoyf, who comes down with a Mandrills to start terrorizing my opponent. She has Dispel, Vendilion Clique, Batterskull, Engineered Explosives, Spreading Seas, and Harvest Pyre in hand, and manages to turn off my green source before snatching a Huntmaster with the Clique. I crack in for 8 and end the game next turn by bouncing Clique before blocks with Simic Charm. Some familiarity between my opponent and I meant tensions were low, and we laughingly joked about how bad Blue Moon is. But seriously, it’s very bad. Do not play this deck. Remember how Twin couldn’t remove Tarmogoyf? Okay, now imagine that same deck trying to remove Tarmogoyf after getting Cranial Extractioned for the combo. That’s Blue Moon. As with my Super Series report, great detail leaves little room on the page. Tune in next time for explosive matches against Elves, Infect, and UW Control. And if you have biting questions about my build, the tournament, or anything else, drop them in the comments and expect a formal response early next week! Been trying this deck lately myself and getting obliterated by aether vial cavern of souls decks that turn every denial leak shoal into a dead draw. Last night I also played prized amalgam dredge – a deck that casts 0-1 spells total by turn 3-4. I like the deck and am probably just unlucky but man its frustrating when your countermagic gets blanked and you’re stuck trying to win a game with a mandril and a goyf against unblockable merfolks or a pair of flickerwisp. Vial decks are good matchups for this deck. Bring in all your artifact removal (all of it!). Those decks are way too slow to keep up with Goyf, Bolt, and Huntmaster if you can remove the artifact. Shoal is important in Game 1 for stopping Aether Vial, but you can also do it with a Denial on the play (Probe helps here). I also like Shoal for two in Games 2 and 3 against Merfolk, since I blow up Vial a lot. And the GWx Vial decks struggle against Blood Moon, even more so if they play Cavern. Good luck! I actually disagree with this assertion. Merfolk is usually at its best when it has blue decks to prey on both in Modern and Legacy, and the fact that Delver damages itself and is vulnerable to tempo plays like Harbinger of the Tides and Vapor Snag only exacerbates the weakness. Death & Taxes also lines up well against any mostly spell-based deck, especially one that is light on the boardwipes (2 Pyroclasm is not going to lead you to the promised land) and reliant on threats that can easily be blocked by the likes of Wall of Resurgence on the ground or Restoration Angel in the air. And then there’s the whole Chalice of the Void issue (both decks can use it with few ill effects, and it’s a huge impediment to Delver decks). With regards to what to actually do about it… Engineered Explosives (on 2 for Merfolk and 3 for D&T) can do some good work for you, and Ancient Grudge to blow up Vial (or Chalice, if it shows up postboard) can also help. Huntmaster is neat, but I wouldn’t pin my hopes on just that, as it tends to be on the slow side (and does a whole lot of nothing against something like Master of Waves/Tidebinder Mage/Wall of Resurgence). You could also consider Radiant Flames as a beefier sweeper that (usually) doesn’t touch Goyf or Mandrills, but gets a wide variety of their guys. Essentially, going 1-for-1 with them will typically result in your losing, but getting 2-for-1s or better could get you there. – Fetch a lot of red shocks (and Mountain!) to get around Spreading Seas. Don’t worry so much about your life total – you’re going to remove the Lords anyway, and Goyf/Mandrills play great defense against a 2/1. – Favor openers that deal with Vial and Lords. A hand with Serum Visions, Bolt, Grudge, any other spell, and some lands is an auto-keep. – Dig for lands when you have Huntmaster in hand and for removal when you don’t. The threats will come to you, and time is on your side anyway, so don’t worry about slamming creatures as fast as possible. – Remember you can bounce Master of Waves with Simic Charm and blow out blocks or all-in attacks. If you kill Vial, it’s also pretty easy to Mana Leak barring a Cavern. Either way, it rarely makes many 2/1’s post-board, since we have so much removal for the other creatures. – Pace your Pyroclasms to get the biggest blowout (on a board with two lords, combine it with Simic Charm bounce mode or a Bolt). Clasm also kills Master of Wave tokens, which is sometimes relevant. – Don’t play three-drop sweepers like Radiant Flames. Darcy, I encourage you to grind the matchup yourself and see if your win % increases. Temur Delver can be frustrating for some players because it requires so many reps to master. But if you put in enough hours, the deck will reward you. Have fun and let me know if you have any questions. shelving it for now but my experience is far closer to what Roland described. “just bolt their lords” well they have like 16 lords and we have 4 bolts, 1 tarfire, and maybe 1 seal of fire (i have been using curiousity there instead personally). They are on avg going to draw twice as many lords as we draw bolts. This is not grixis, jund, or jeskai where we are packing upwards of 12 cheap removal spells and a set of snapcasters and can just leave them with cursecatchers and silvergills. Unless I’m mistaken the idea of this deck is stick 1-2 threats and protect them. Merfolk and D&T don’t try very hard to kill the 1-2 threats so our “protection” becomes largely a liability (esp when even mana leak gets nuked by cavern/vial), and when it comes down to a race our 4/5 and 4/4 do not move as fast as merfolks exponential growth and D&T can make brutal value plays like chump-flicker re-buying an ETB or just throwing a finks or blade splicer under the bus to buy time. I like the deck, but I think its misleading to call merfolk or D&T (or vial/cavern decks in general) good matchups. That’s the general idea, but the way this deck plays changes drastically depending on the matchup. Against Merfolk, that’s not what this deck does at all. I think it’s a question of experience, since I had all the same problems when I started playing the deck and don’t have them anymore. This and the Wednesday articles are all I care about. Make more! Maybe a brew with something like this is worth while? Not sure. Really not my kind of deck, but something like this will definitely win at locals sometimes, at least. Right off the bat though, I think Visions is a 4- or 0-card in the main. Thanks for the write-up! Temur Delver has an extremely punishing learning curve, but it’s my favorite deck in Modern. Took me weeks and weeks of getting pounded at LGS Modern night before started getting any consistent wins. I’ll be looking forward for the part 2 of this article! I don’t usually respond to comments like these, since I have nothing constructive to contribute, but I love seeing them. Keep grinding and learning, and have fun! Part 2 will be out on Monday. Good to see you back on Delver, Jordan, and congratulations on the Top-8 (though you’ll be sharing the full details of how you got there with us next week). Given the admitted troubles that your current shell has with 2-drop creatures such as Bob and Goyf, would it be worth your while to include Spell Snare in the 75 in some way? It can get pitched to Shoal when irrelevant, and it’s always live against the guys I mentioned, plus other threats like Plating, Searing Blaze, Merfolk Lords, etc. This would also make it easier to trim all of your Shoals, thus exposing you less to those nasty being-behind-on-cards situations that we all know Jund feasts upon. Shoal is golden in so many Modern matchups that I wouldn’t want to play this deck without it. I think this deck can trim Shoals with some success, though, especially when it brings in Snares to replace them. I tried a 3-1 Shoal/Snare split for a couple weeks last month and usually wanted a Shoal instead, so I put the fourth back in and cut Snare. I also tried Snare in the board specifically for those Tarmogoyf decks, and it was okay there. The problem with a sideboard Snare is we lack slots. The version I was testing cut Curiosity and Mountain for two Snares. The card can definitely work in this deck, I think it mostly comes down to expected metagame and personal preference. Some people really hate Shoals, for instance, and they should definitely load up on Snares IMO. Good writeup, it’s always great to read someone who has taken the time to learn their deck But who the hell plays form of the dragon in modern? Hey man, I seent it. Modern is like Diddy hosting the 2005 VMAs – anything could happen.